You never know when disaster is going to strike. But, with a great attitude and a lot of hard work sometimes our biggest trials can yield amazing opportunities. Our alumnus Joseph Jackson from New Jersey is a prime example of persevering through the difficult times. When Hurricane Sandy destroyed his shop, home and community he dug deep and found new opportunities in the midst of chaos. 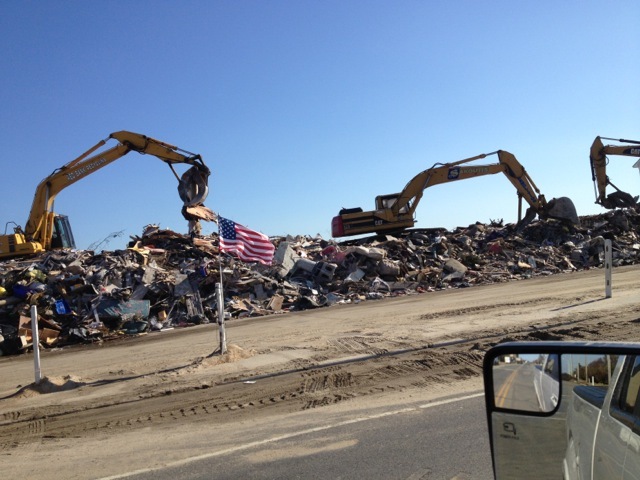 The public beach in Monmouth Beach was used as a staging area for trash and debris. The landfills all closed because there was too much for them to hold. Like many others in the area Joe wasn’t nearly as prepared for Hurricane Sandy as he thought he was. 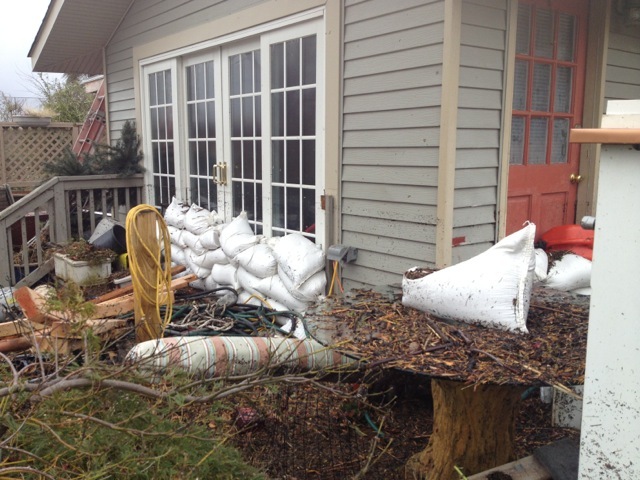 In the wake of the hurricane he was left with over 4 feet of water in his shop and home office and more than 6 feet of water in his storage areas. Everything with a gasoline engine no longer worked (generators, air compressors, dump truck, cement mixers, plate compactors, etc.) and his power tools and supplies were also ruined. All of his concrete supplies (mixes, pigments, fibers, pozzolans, etc.) were soaked and unusable. In his offices the devastation continued with lost files, records, backup devices, computers, etc. This is the back of Joe’s home the morning after the storm. Everything was under water and things were in his yard that he has no idea where they came from. It was an experience that left a mark, both good and bad, that he won’t ever forget. It’s been over a year since the hurricane struck and for the rest of us it seems long forgotten, but for those living in New York and New Jersey, Hurricane Sandy is still part of the everyday reality. Recovery is going well, but it takes time. Many people are still out of their homes in Joe’s area. The rebuilding effort has transitioned from mostly clean-up work to reconstruction and is now moving in to lifting homes. Joe specializes in custom building and remodeling, of which concrete is only a small part, so he’s been busy, busy, busy every step of the recovery process. On a positive note business has been incredible. Joe and his company are incredibly busy helping people rebuild their lives. They’ve learned a few key lessons along the way as well: how to make do with less and a deep understanding of those impacted by the flood. Joe and his crew have been there and they have a whole new appreciation for what people are going through. 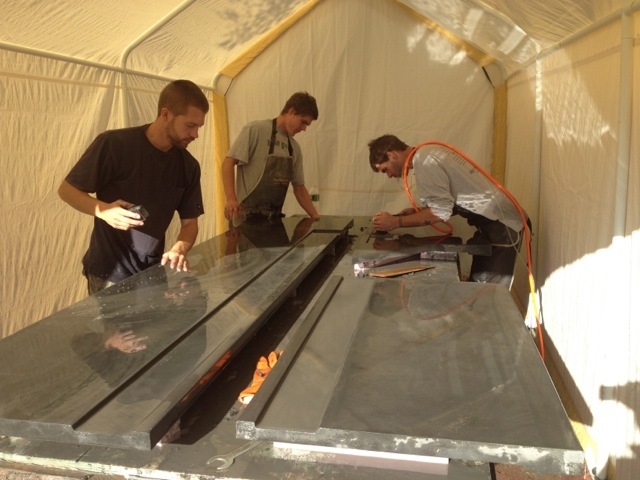 Casting concrete outside in a makeshift tent. It will be a while before things get back to normal. As his shop was destroyed Joe and his crew now do their concrete casting outdoors and in makeshift tents, which can be very cold during the NJ winters. (I was able to give Joe some tips for how to best make this cold casting happen.) Joe now has a new office space complete with a desk he put together using concrete he cast before Sandy and rescued from the flooding. 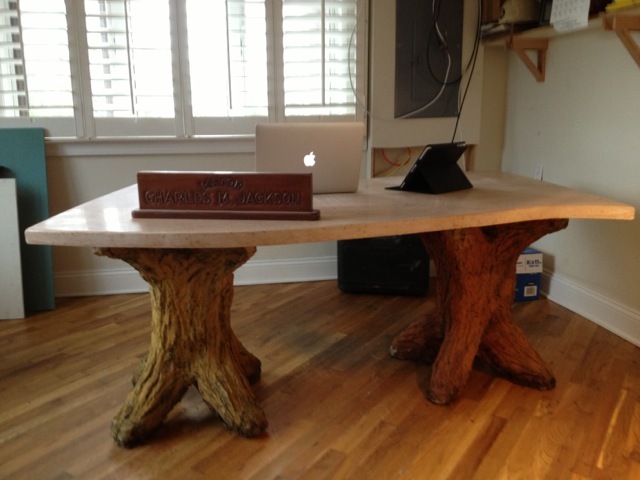 A new desk Joe created using concrete work salvaged from the destruction. We’ve had the opportunity to work with Joe in three of our courses and it is always a delight. His positive attitude radiates through all he does and his can-do spirit make all who meet him want to dig in and try a little harder. Wherever your concrete journey takes you, through good times and bad, we love supporting our students and watching them rise to the challenges they encounter. Thank you Joe for sharing your work and your journey with us.